Search for plans near you. We provide FREE simplified access to 15 plus years of Department Of Labor's Annual Financial Reports for Retirement and Welfare Plans (Form 5500), PLUS Tools to best utilize your selection with Unique, Professionally Maintained Advanced Data Mining Applications. Don't Let A Standalone Form 5500 Put you in Jeopardy! Retirement plans are dynamic tax exempt entities which are tied to prior key transactions, legal requirements, trends and Plan performance. 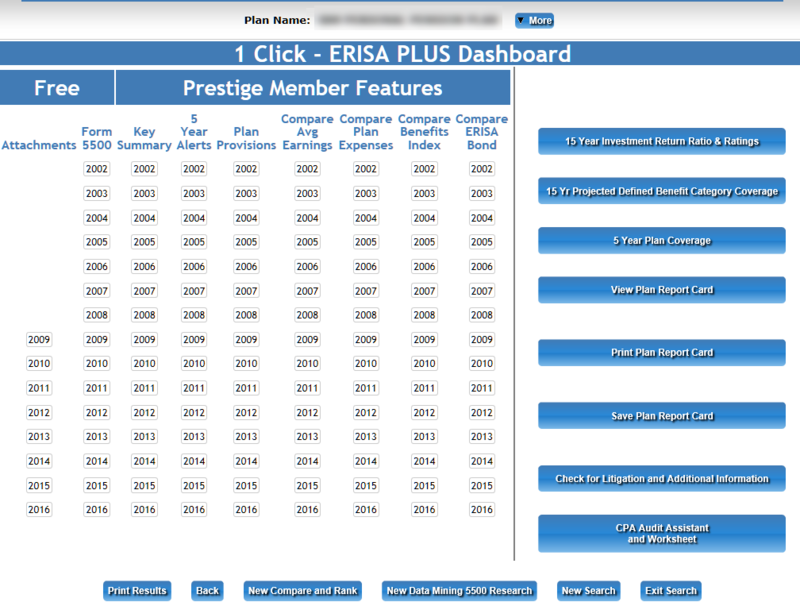 The PensionInspector's Prestige Vision upgrade , reviews information you must know from 5 to 15 Years, your selection, from more than 10 million Erisa Plans in a span of 15 Years and delivers to you THE BIG, PRIOR REPORTED PICTURE, to your wireless or PC, at an affordable subscription price. We are Wireless Compatible and live in the Cloud for 100% Service. Special Promotion - A 1 Year Subscription To 3D Five Star Data Mining and 3D Comparea and Rank - 2 Ultimate Data Mining Applications. Free Enrolled Retirement Plan Actuary to Assist. I have been utilizing PensionInspector for a couple of years. The website and the information one can retrieve is much easier, faster and adds much more depth to a plan than the DOL website. For one thing, you do not need the Administrator's UserID to access the information. With just a few clicks, you can get all the information you need to review a plan for takeover consideration. You can review plans for at least five years past 5500 history. If there appear to be any compliance issues with the plan, you can access that information right away, rather than a headache in the future. I highly recommend the website. Presenting a 5 year key plan performance analysis. Providing prior years key reported plan failures. to reconcile current year 5500 audit results as required by the Department of Labor audit requirement.